Also known as Brazil cherry this ornamental subtropical small tree can handle some cold. Seedlings can begin fruiting at 2-5 years old. 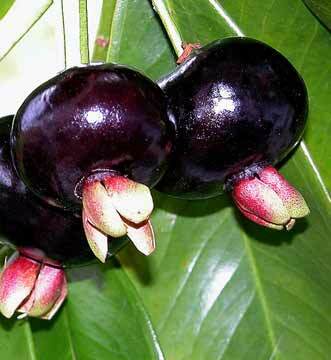 The edible round, purple-black fruits are bourne in clusters and taste like cherries with delicious soft, melting, sweet flesh. As well as eaten fresh they can be made into jellies, jams, juices, pies, sherbet, ice cream or wine. The tree makes an attractive feature or hedge, with dense foliage in an upright, compact growth habit. The showy white flowers, up to 3cm across are produced in large numbers on flushes of new growth in early spring to late summer. It is loaded with fruit 30 days later. Leaves are reddish when young then turn glossy dark green. A leaf or bark infusion (10 g of plant material in 300 g water) is aromatic, astringent, diuretic and taken as a treatment for rheumatism at the rate of 2 to 4 cups daily, in Brazil. Also known as Eugenia dombeyi. Limited stock: only 3 per customer please. Can be grown in sun or part shade, better fruiting is in sun. The tree is hardy provided you can offer it protection from frosts when young. It can withstand light frosts once established. The grumichama survives temperatures as low as -3� C in Brazil. Although tolerant of a wide range of soil types (except basic/limestone), it prefers deep, fertile, acidic sandy loam. It has good wind resistance. Although quite drought tolerant, water regularly once fruit appears for proper fruit set. A low nitrogen and high potassium fertilizer is recommended for good fruit production.